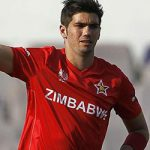 ZIMBABWE has snapped its four-game losing-streak with an emphatic 31-run win over Bangladesh in the third T20 International. The visitors racked up 187-6, its highest total against Bangladesh, after four straight defeats in T20 cricket. 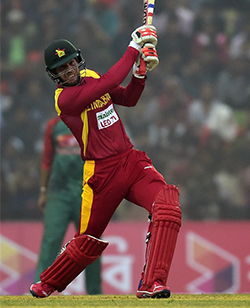 Bangladesh was restricted to 156-6 after a disciplined performance from Zimbabwe’s bowlers. Zimbabwe got off to a rapid start, thanks to stand-in captain Hamilton Masakadza and Vusi Sibanda before Shakib Al Hasan (3-32) helped Bangladesh claw back halfway through the middle. 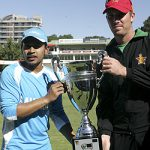 Sibanda and Masakadza capitalized Bangladesh’s inexperienced bowling attack to score 45 in just four overs after which the latter was dismissed. While Sibanda went after debutant fast bowler Abu Haider, Masakadza found another debutant Mohammad Sahid particular to his liking after he opted to bat first following a delayed toss. Sibanda stole 18 runs off Haider in the third over, hitting three fours and a six in a row. Inspired by his fellow opener’s power-hitting, Masakadza came on hard Shahid to hit consecutive four boundaries before the bowler took a revenge by dismissing him with Zimbabwe. Masakadza sent the ball across the rope four times in his 14 ball-20. Rain came as the blessings for Bangladesh bowlers with Zimbabwe on 72-1 after seven overs. Left arm spinner Shakib Al Hasan helped the side claw back as the runs came in abundance. Just after play resumed, he picked up Richmond Mutumbami for 20 and simultaneously got himself into the record books yet another time. Mutumbami became Shakib’s 400th wicket at international level. 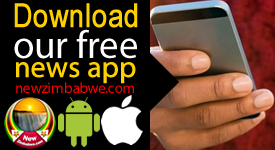 He made the crucial breakthrough in his next over with Sibanda failing to connect properly with a pull. Sibanda’s 33 ball-knock was made up off six fours and a six. He combined for 74-runs stand with Sean Williams to take the side to a dominant position. Waller hit four sixes and two fours in his 49 off 23. Bangladesh, which made five changes with four player making their debuts, had a shaky start with Imrul Kayes, the replacement for Tamim Iqbal, being dismissed for 1 with the team at 2-1. Sabbir Rahman continued his rich vein of from, following a 67-run parternship with Soumya Sarkar (25) to keep the side in the hunt. With Sabbir in an aggressive mood, Sarkar’s dismissal hardly bothered Bangladesh. Leg-spinner Graeme Cremer dealt the hosts a final blow, wrapping up the series with a match to go, after taking Sabbir, shortly after he reached his second half-century. Sabbir hit nine fours in his 32 ball-50. Cremer then made a giant stride toward the victory having got the better of Shakib (3). Sikandar Raza (2-7) complimented Cremer’s job by adding two more wickets as Bangladesh eventually ran out of time. Nurul Hasan remained unbeaten on 30 but couldn’t deal with the pressure when the run-rate got alarmingly higher.